On the Configuration app’s Upload page, you can view and change the folder where files are held temporarily during upload. In the Apps URL box, enter the URL for Apps, and then click Save. In the Office Add-in Configuration Files box, enter a network path that users have Read permissions to, and then click Save to generate the add-in files. 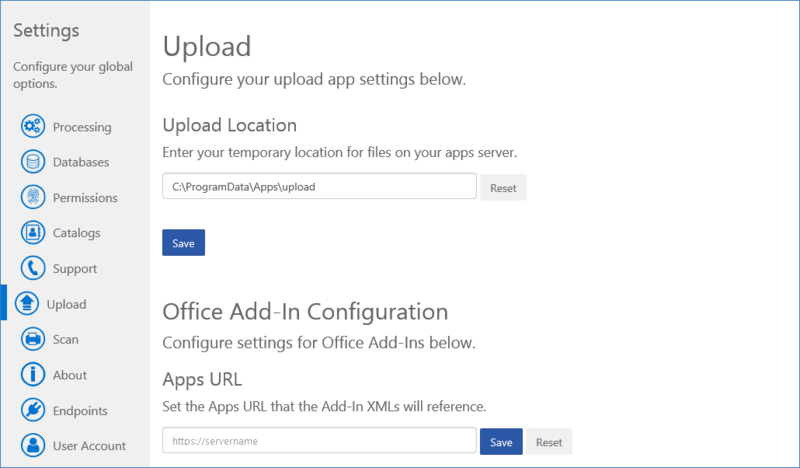 NOTE: The Office Add-In settings in the Upload Page will only display if your site is configured to use SSL. Your site is required to be in SSL for this as a requirement of the Microsoft App Store.